Wait, NWOBHM bands were still around in 1986? 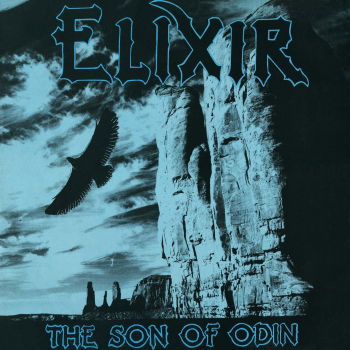 That was probably the same question I asked myself when stumbling upon Elixir‘s first full-length album “The Son of Odin” quite some time ago, and boy, was it a day to remember. Coming into the scene very late, Elixir took on a different approach with regards to their overall sound. By this time, pretty much most of the NWOBHM bands slowly drifted apart, as the popularity in other genres, such as speed and thrash metal were beginning to take flight. The scene seemed to have reached its limit in terms of pumping out new and exciting bands; I mean, where else do you turn to after listening to bands like Angel Witch, Saxon, Praying Mantis, Saracen, Bashful Alley, Jaguar, Trespass, Weapon and others? Well, the guys over at Elixir will surely change that thought. From beginning to end, “The Son of Odin” completely immerses you in a much more dark setting than what you might have expected, as Elixir‘s distinctive riffing structure produces an “evil-sounding” tone to them. This is surely accentuated with singer Paul Taylor’s more aggressive approach to melodic singing. Then again, I wouldn’t necessarily consider them as part of the NWOBHM movement, as they remind me more of a power metal band, which is not a bad thing at all. The riffs are flying left and right through different tempos and technical forms, and therefore doesn’t drag the album out at all. “The Son of Odin” offers nothing less than pure melodic steel, in all its glory, where no song lacks the originality and spark in the others. However, the highlights of the album are quite distinguishable, firstly being “Trial By Fire” and then “Treachery”, which was also released as a single the year before. They truly capture the true essence of the power metal sound, all while offering the listeners with nothing more than quality metal. You can never go wrong with a release like this, a true masterpiece of its time.